Use the About command on the Help menu after running the license installation received after purchasing VueMinder Pro or Ultimate. After VueMinder Pro or VueMinder Ultimate has been registered, the Buy VueMinder dialog and menu options are replaced with "About VueMinder". This dialog shows the current version number and update protection information. After purchasing a license, you will receive an Update Protection code. There are 3 update protection options when purchasing - 12 months, 24 months, or lifetime updates. The 12 month option is free. Update protection allows product updates, including new major releases. It also provides the highest priority when contacting our technical support team and free replacement of your license installer, in case you lose it. After entering the provided Update Protection code, its expiration date will be shown. After the Update Protection expires, you can continue using your current version of VueMinder for as long as you'd like, but you will no longer be able to receive product updates and you'll have a lower priority for any technical support. 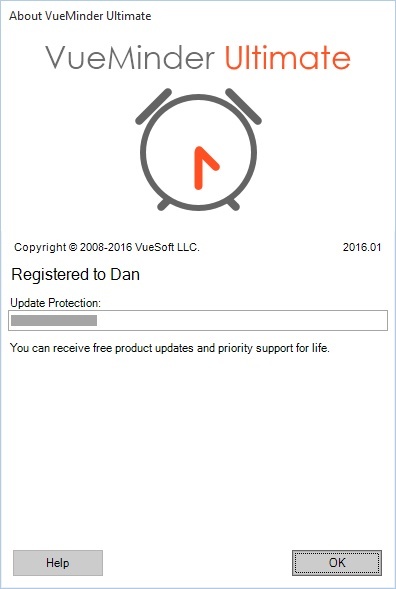 The lifetime update protection never expires. To renew your update protection, you can click the Renew button. Update protection can be renewed for 12 months, 24 months, or lifetime. Note: You do not need active update protection to run the program - only to receive product updates and priority support. The program license itself never expires.